I was talking about Israel the other day with a couple of cousins who had recently been and we were all reminiscing about the falafel there. We all agreed that we have yet to try any here in the US that comes close. It just can't be replicated. This was exciting for me to confirm, because I thought I was just being a snob about it, but apparently i'm not the only one. I don't know how they do it, but in Israel, the falafel always has this shatteringly crisp outer shell and the creamiest, yet perfectly cooked insides. Since Haifa was the first place I ever tried falafel, I basically ruined myself forever, but even so, it's pretty much fact that most of the falafel sold here is dry, crumbly, over cooked, over-herbed, or (shudder) served cold. Just, no. In the 10 years (!) since I was in Israel, I have tried many a falafel, from random salad bars, Middle Eastern restaurants, non-Middle Eastern restaurants, and dedicated falafel shops. In that time, I've realized that if I want to eat anything close to my ideal, I'm going to have to make it myself. Fortunately for me, years ago Epicurious published a falafel recipe from Joan Nathan, including head notes that made me suspect she was just as picky as I am about her chickpea fritters. Hers is the closest I have come to the perfect memory in my head, and I've tweaked it a tiny bit here and there over the years to result in the best falafel I know how to make. It's spicy, fluffy but creamy, and crispy, with just the right amount of herbs. It's the most authentic Israeli falafel I've found without needing a trans-Atlantic flight on El Al. Here, I've formed the falafel mixture into larger patties and shoved them into split pita buns with Israeli salad, pickled onions, hummus and a spicy harissa tahini. You end up with what I'm calling a falafel burger, because it really resembles nothing else. It's huge and delicious and filling, but plant-based enough to claim virtuosity if you need it. These are in fact entirely vegan, if you're looking for a little mid-holiday season break from rich meats and butter-laced starches. Though of course store-bought is fine, I would heartily recommend making the pita buns yourself, since it's actually a very simple process. Homemade pitas just come out fluffier than their commercial counterparts, which for me is crucial from a texture perspective, but I realize I'm also calling for deep frying and garbanzo soaking and for pickling as well, so do what makes you comfortable. 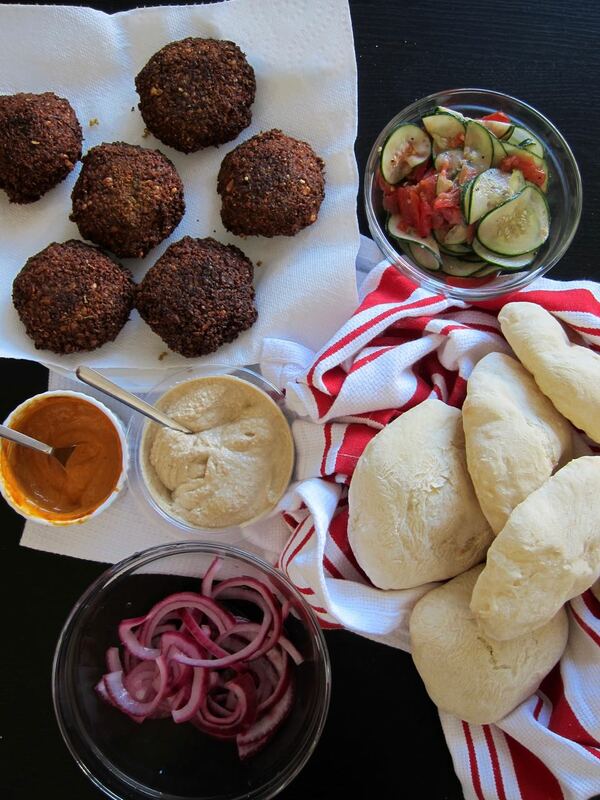 The falafel itself is enough of a Sunday project. 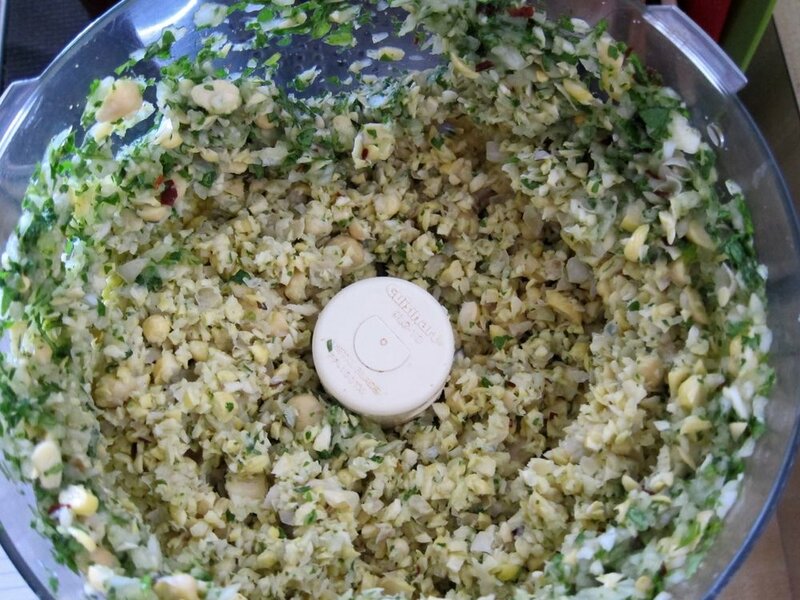 In a food processor, add onion, parsley, cilantro, salt, chile flakes, garlic and cumin and pulse until finely chopped. Add chickpeas and pulse until finely chopped but not pureed. Add baking powder and 4 tbs flour and pulse until combined. Test a bit of the mixture: if it holds its shape when you squeeze it together and doesn't stick to your hand, it's ready. Othewise, add up to 2 more tbs flour. Transfer mixture to a bowl, cover, and refrigerate for several hours or overnight. 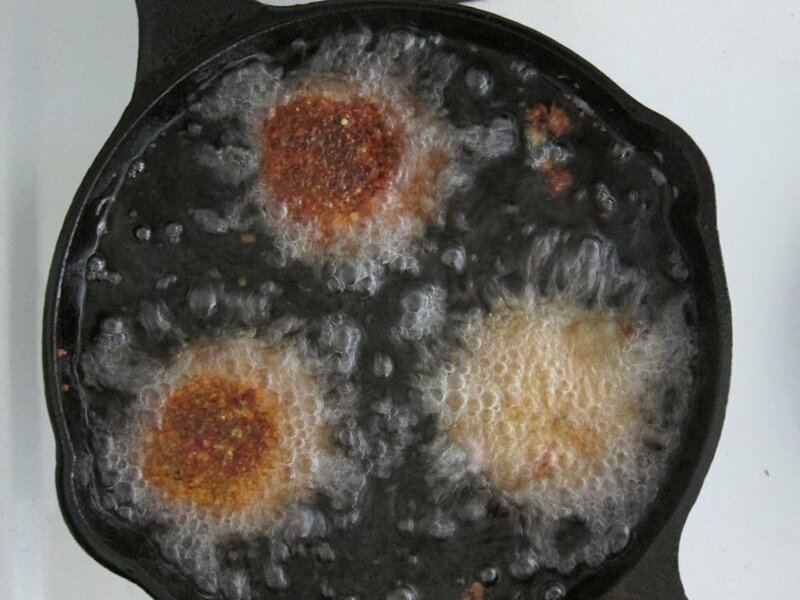 When ready to fry, heat an inch of canola oil in a large cast iron pan to 375 degrees. Form dough by 1/4 cup scoops into thin patties. Fry until golden and puffed a bit, flipping if needed, about 3-4 minutes. Drain on paper towels. 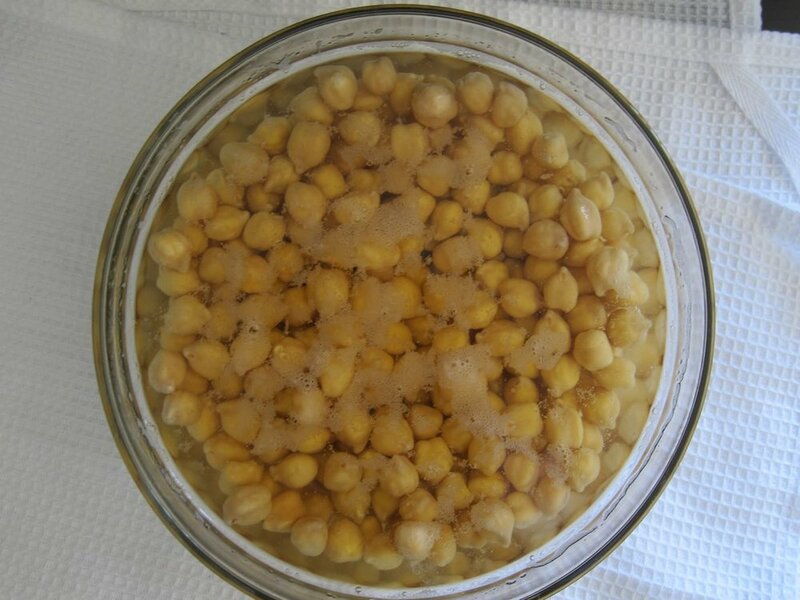 To get that perfect, creamy texture, you really need to use raw, dried chickpeas that have been soaked overnight. Canned chickpeas will work in a pinch, but they are already pre-cooked, so will result in a falafel that is mushier than I prefer. To get the falafel creamy and cooked through without burning the outside, you may find that you need to lower the temperature of the oil to 350. In a bowl, combine the cucumber, tomato, lemon juice and a drizzle of olive oil and toss. Season with salt and pepper to taste. In a small pot, bring water and vinegar to a boil and then pour over the onions in a heat-proof bowl. Let sit at least 20 minutes. In a small bowl, combine tahini and harissa, and mix with enough water to thin to a pourable consistency. Assemble burgers: Split open pitas and slather inside with a good amount of hummus. Stuff with a falafel patty, cucumber and tomato salad, and pickled onions. Drizzle with spicy tahini and garnish with pickles, if you want. Mix water, yeast and salt in a large bowl and add flour. Stir to fully combine, scrape down bowl and stir to make sure everything is welll combined. Dough should be very wet. Loosely cover with plastic wrap. Let sit at room temperature for about 2 hours, or until dough rises and begins to flatten on top. You can use the dough at this point or store the dough in the refrigerator until needed (the longer it sits in the refrigerator the more flavor will develop). When ready to bake, heat the oven to at least 500 degrees, and preheat a baking stone or steel. Dust the surface of the dough and divide into 8 equal pieces. Shape into balls and dust a large, flat surface with plenty of flour. Roll dough into 1/8 inch thick rounds (if they are too thick they won't puff). You may need to add flour if dough sticks too much. Transfer rolled rounds to a sheet of parchment on the bottom side of a large baking sheet. Slide the parchment onto the hot baking steel or stone, and bake 5-7 minutes, until puffed. When done, remove pitas from oven and wrap baked pitas in cloth dish towel and set on a cooling rack. As they cool, pitas will deflate a bit and the crust will soften. Repeat with remaining dough.